Three Kings Parades in the Axarquia 4-6 January 2019. Starts from 3 pm until 7:30 through the streets of the pueblo. 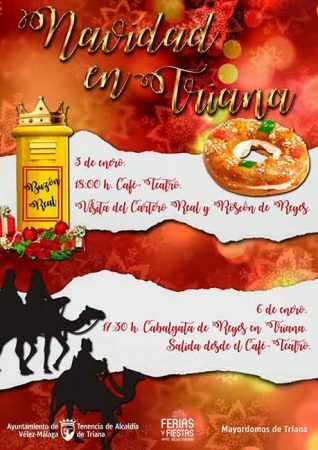 After which you can enjoy traditional Three King’s cake and hot chocolate at the Centro de Art y Dessarollo Popular. The kings will then give gifts to the children. There will also be a bouncy castle at Calle Alta No. 2 as well as some snow!! Through the streets of Mezquitilla, Algarrobo Costa and Trayamar from 4:00 pm. From 5:00 pm at the town hall. 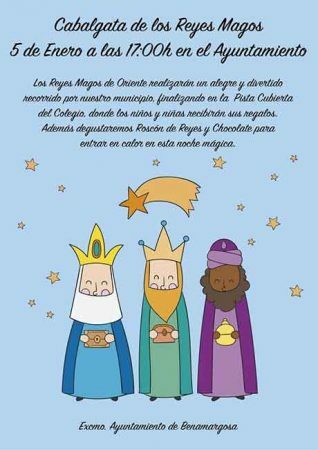 With Three King’s Cake and Chocolate, and the distribution of presents at the end of the procession at the Pista Cubierta del Colegio. 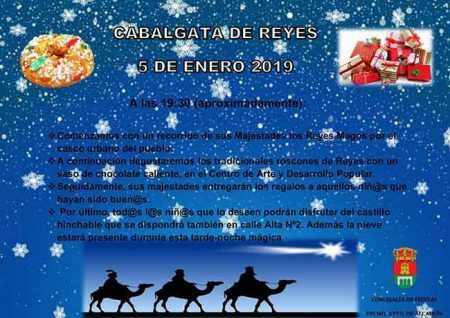 Advertised as a ‘Cabalgata Marinera’ a seafaring cavalcade- from 4:30 pm at Lonja del Puerto through calle Don Faustino, Avenida Andalucía in the direction of Algarrobo, turning down calle Real, Calle Las Casillas, Avenida Andalucía and arriving at Colonia del Puerto III. 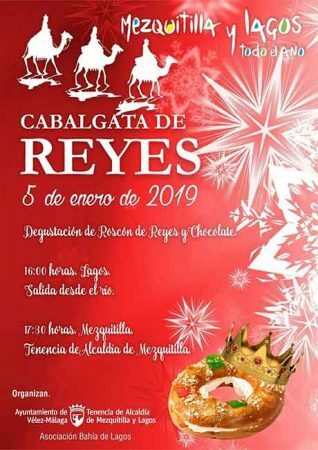 At the end of the parade there will be a ‘Roscón’ cake for everyone, chocolate, and the kings will distribute gifts to the children. From 4:00 pm – 5:30 pm including the Three King’s cake and chocolate. Parade starts from the river and ends at the Mayor’s office. 4:00 pm: The arrival of the Kings at the Arcos del Balcón de Europa. 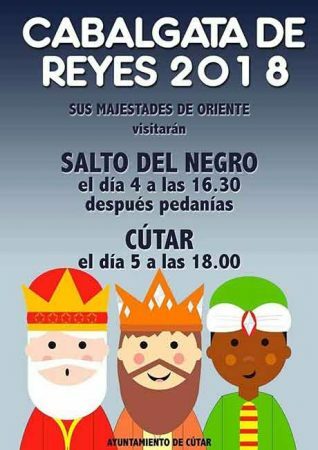 5:30 pm: Parade of the Three Kings : starting from the Parque Verano Azul to Calle Jaén, calle Diputación, Granada, San Miguel, Plaza Cantareror, Pintada, Puerta del Mar, Balcón de Europa, finishing on Plaza Cavana. 8:45 pm: The Kings on the Balcony of the town hall where they recieve the magic key that opens the doors of the houses of Nerja’s children. One child, who represents the children of Nerja, will address a few words to their majesties before they distribute their gifts. 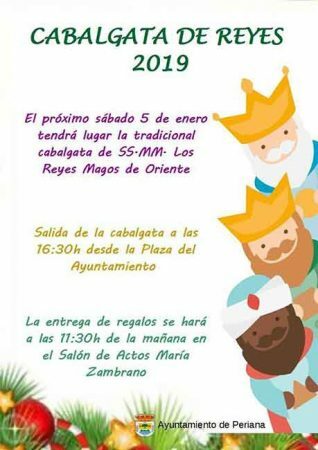 Reception of the Kings at the Salón de Plenos at 12:00. 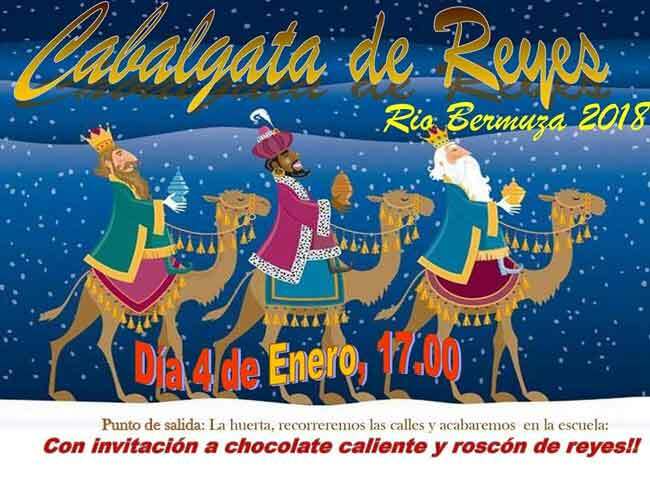 Parade starts at 4:00 pm from Los Rubios finishing at Cala del Moral. With 5 floats, a train and 2 convertible buses. With 11 floats from 5 pm at the Tenecia de Alcaldía. Six tons of sweets will be distributed! The parade’s route is avenida de Colón, calle Rodrigo Vivar, Octavio López, Paseo Marítimo de Levante, Paseo de Larios, calle San Martín, calle Ros Alférez, Virgen de las Angustias, calle del Mar, Paseo Marítimo de Poniente until the roundabout of avenida Antonio Toré – Toré. 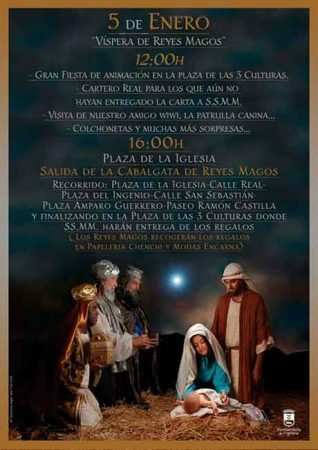 From there it will depart to avenida de Andalucía, calle Princesa and end on the plaza de la Paz, where there will be a living nativity scene. Torrox: At 5:00 pm. With 5 floats. 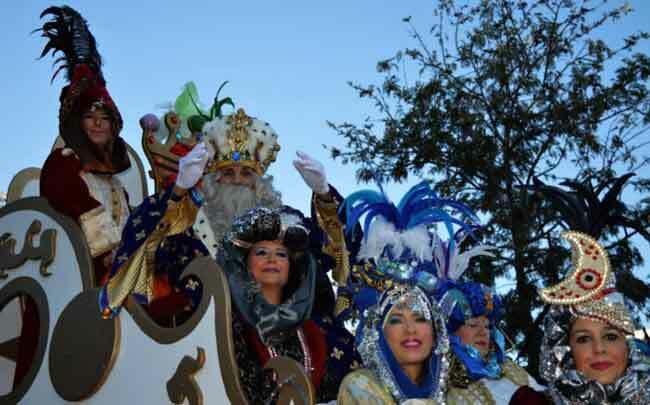 The parade will start at El Morche, the route going through La Corrida de Frutos González (N-340), Paseo Marítmo El Morche (N-340) and Generación 27 and the Avenida El Faro and will later climb to Torrox Pueblo, Calle Aledina, Las Moreras and onto the Plaza de la Constitución. 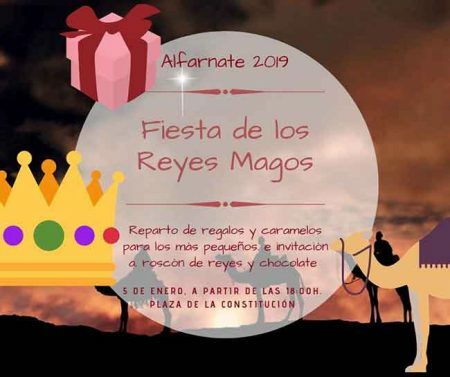 The Three Kings Parade starts from 11.00 am with a reception of the Kings on the Plaza de las Carmelitas, at 1:00 pm they visit the Residencia Seniors; 1.30 they visit the Hospital Comarcal de la Axarquia; 6 pm, the official parade from the Plaza de las India; at 9 pm they arrive at the Plaza de las Carmelitas. 11:30 am. The streets of Algarrobo. From 12:00 from the Mayor’s building and following the route of C/ Halcón, C/ Colirojo, C/ Francisco Merino Ramírez, C/ Oropendola, C/ Campo de la Iglesia, N-340, direction to Almería until the roundabout of La Sirena, direction to Cádiz, until C/ Campo de la Iglesia, Camino de la Iglesia and back to Mayor’s building. Streets of Maro from midday with presents delivered on the Plaza de la Iglesia. From 4:00 pm. From instalaciones Trops to new roundabout to Poeta García Valverde, ending at Mayor’s building. 5:30 pm Parade starting from el Café Teatro. From Arroyo Monedas, down to stream and onto Crta. towards Vélez until the entrace to the Pueblo and back to Crta. de Benamargosa, ending at C/ Estudiantes, and Mayor’s building. My husband and I worked in this lovely part of Spain for over 11 years, founding both a magazine and newspaper for English speakers in the region. Always our aim was to give people a better insight into the fascinating eastern Málaga region, something that we now aim to continue with our website. Don't miss an event - Sign up for our Newsletter! We promise not to bombard your inbox with tons of emails, just our occasional post about what’s happening in the Málaga east region! © All rights reserved 2019. MalagaEast.com is the definitive guide to the east of Málaga - also known as La Axarquia - a spectacular undiscovered jewel on the Costa del Sol; the ideal region for long summer holidays... and for short winter breaks!